14 1/8 x 36 1/8 in., framed. pastel on paper, signed in pencil lower right, 16 x 14 in. oil on canvas, signed and dated upper left, titled en verso, 42 x 28 in., unframed. Condition: A couple of areas of paint loss (one at upper middle and upper left). Oil on canvas, signed lower middle, titled en verso, 24 x 40 in., framed. A Rare Shearwater Pottery Plate, c. 1930-40, decorated by Walter Inglis Anderson (1903-1965) with stylized figures of great blue herons in teal blue and black slip, impressed dime size mark, diam. 8 1/2 in. oil on canvas, initialed “MJS Jr.” lower right, 16 x 30 in. In the original period frame bearing partial label from E.T. Blessing en verso, 21 x 35 in. Provenance: Descended in the family of noted music critic Adolph Pollatsek (Hungary/New Orleans, 1841-1906) and his granddaughter, ballet dancer Constance Reynolds Green (New Orleans, 1916-2012). Oil on masonite, signed and dated lower right, 48 x 36 in. Exhibited: Betty Parsons Gallery, New York, NY, Dusti Bonge Solo Exhibition, April 30-May 19, 1956. Sold to an Important Southern Institution. Amanda Winstead is knowledgeable about the ever changing markets for a wide range of fine art and antiques. She can best advise you of how to sell a single work of art or a whole collection. In some instances, Ms. Winstead can sell the work through Amanda Winstead Fine Art LLC., her private art brokerage firm. With a presence on ARTSY and a proprietary mailing list of over 1,750 collectors, AWFA effectively reaches a target group of clients for Southern Regional art. Additionally, Amanda Winstead has worked in association with Neal Auction Company in New Orleans since 1996 and has extensive experience in the proper sale and presentation of fine collections at auction. Some of the notable collections sold under her direction at Neal Auction Company include the Charles and Susan Murphy Collection of Newcomb Pottery, the inventory of Manheim Antiques of Royal Street, New Orleans, and property from the Old Spanish Custom House on Moss Street, New Orleans. In the spring of 2000, Ms. Winstead discovered a painting by the 19th c. Austrian artist Eugene de Blaas in Shreveport, Louisiana. Under her direction, it sold that June at Neal Auction Company for $484,000, a record price for the most expensive piece of art to ever sell at auction in Louisiana until it was exceeded in May 2006. Presently, Amanda Winstead is a consultant to Neal Auction Company and holds the position of Senior Appraiser, Fine Art. She is able to offer advice and estimates on potential auction consignments and guide clients through the auction selling process. Her extensive network of contacts in the art and auction business from coast to coast allow her to help you identify the best and most appropriate sales venue for your property. 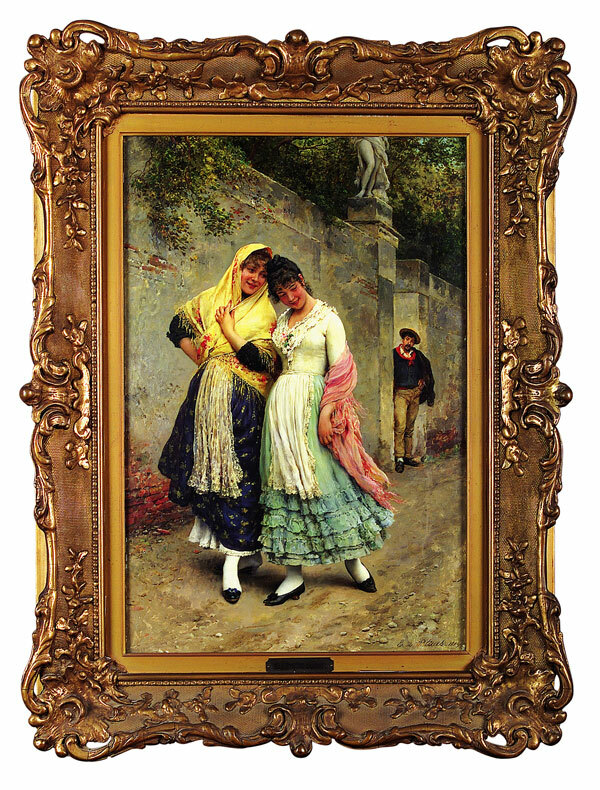 Eugene von Blaas (Austrian, 1843-1931), "The Flirtation", oil on panel, signed and dated "1889" lower right, 32 in. x 20 3/8 in., in the original frame under glass. Sold on June 3, 2000 for $484,000, A RECORD PRICE AT AUCTION FOR A FINE ART OR ANTIQUE OBJECT SOLD IN LOUISIANA AT THAT TIME.